Best friends, Finn and Jake, live in a treehouse in the so-called Land of Ooo. Day in and day out they solve quests, fight off monsters of literally ‘all’ kinds, and help science buff Princess Bubblegum and her candy people – walking, talking cinnamon buns, lollipops, and ice cream cones. 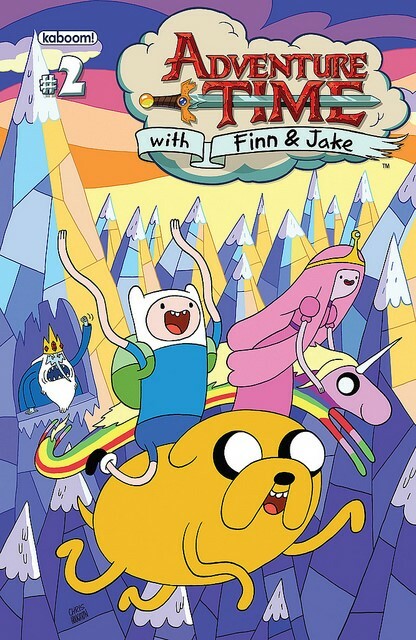 Also, Finn’s very elastic, talkative, and party-loving dog Jake has a Korean-speaking girlfriend that’s half-rainbow, half-unicorn. Rest assured, there are stranger things than those you see in Ooo where there’s a staggering surprise around every colorful corner. At first, I stayed for the absurdity, the comedy, and the sheer fun. But a few episodes later, I got the strong sense that not everything is as it seems here, that something is rotten in the Land of Ooo. [Mild spoilers ahead]. My doubts were nurtured by characters nonchalantly dropping statements like “I thought humans were extinct” – statements easy to miss in the bizarre blur of Adventure Time. Suddenly, someone mentioned “the mushroom war” having taken place in the distant past. And didn’t we – just for a fraction of a moment – see a few atomic bombs, next to an old, broken TV set in the intro? Could it really be? It takes the show several seasons to deliver this nuclear bombshell twist bit by bit. Despite being the last human on what used to be Earth, Finn usually wears a confident smile with his cute bear-eared cap. Ooo’s implied post-apocalyptic history is much more serious for the viewers than it is for the creatures living out their radioactive consequences on screen. One could claim the terrifying backstory of the oh-so colorful Land of Ooo is symbolic of the overall dual nature of the show. There’s lots to see and laugh about when Finn and Jake go on their wacky adventures. However, almost every episode is packed with smart, meaningful dialogue or jokes that may go over the heads of very young viewers. Also, with each season, the characters grow along with their world and plotlines. The eleven-minute episodes become more and more interconnected. In fact, most storylines of Adventure Time get as deep and emotionally relevant as those of a good, live action TV drama series. Yes, Adventure Time is about a heroic boy, his magical dog, and – of course – adventure. It’s also about growing up, friendship, (unrequited) love, and being different. Its subtext is, if you’re willing to face it, incredibly sad. And even one of the oddest, out-of-this-world episodes can be touching on a topic as serious as living with a disability. Silly, cute, epic, funny, dramatic – despite its appearance, Adventure Time has got it all. Unlike other adult cartoon shows, Adventure Time doesn’t rely much on cynicism, shock-value, or current cultural context – of course, there’s nothing wrong with that, but it’s refreshing to watch an adult cartoon show without these ingredients. But wait, is Adventure Time a cartoon show for adults? “The show is for kids more than anyone else,” series creator Pendleton Ward commented in an interview; however, not without adding that he and his writers were primarily focused on creating something they themselves enjoy. The result is a cartoon show spanning ten seasons that not everyone will – but can – enjoy, including you, me, and smart barkeepers in fancy bars.